Your IT. 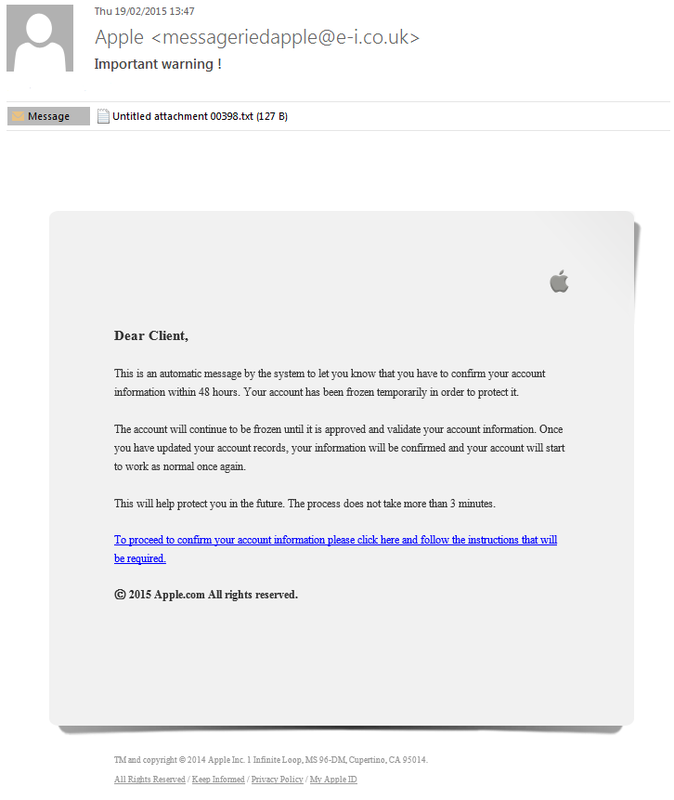 At risk from email scams. Reputation - They will appear to come from a reputable organisation (e.g. Apple, Microsoft, a large bank, the Government). This makes you want to trust the email. Mechanism - They will either contain a link to a website which you are encouraged to visit, or have an attachment which you are encouraged to open. At the point that you click on the link, or open the attachment, you have taken the positive step to allow your computer to be infected. It may even appear that nothing has happened, but that is not necessarily a good sign. If the attachment or link attacks your computer using an unknown method of infection, then your anti-virus or anti-malware software may not be able to protect you. The best form if defence is not to click on links or open attachments in emails unless you know, for sure, that the email is from a genuine source. Don't assume that, because you recognise the sender's email address the message is fine - if their email account or PC has been compromised, the emails could be sent without their knowledge. If an email contains a link, you can hover the mouse pointer over a link to see the actual link address. In the example below, clicking on the link for www.hmrc.gov.uk won't take you to the UK HM Revenue and Customs website, but to a website with an Italian domain name. 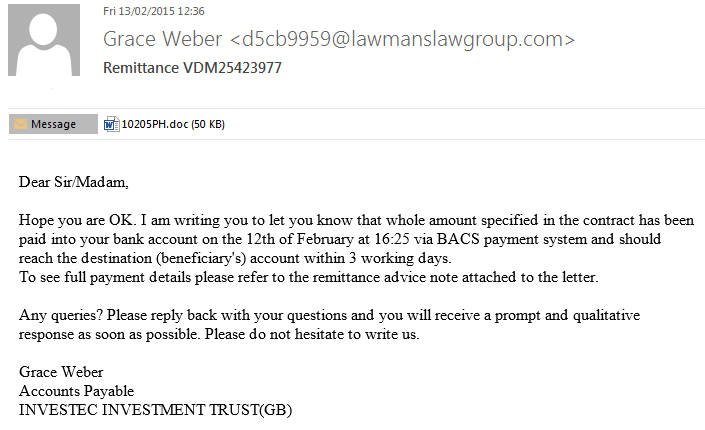 Below are a collection of scam emails that we have received. If you receive the same, then do not click on the link or open the attachment. 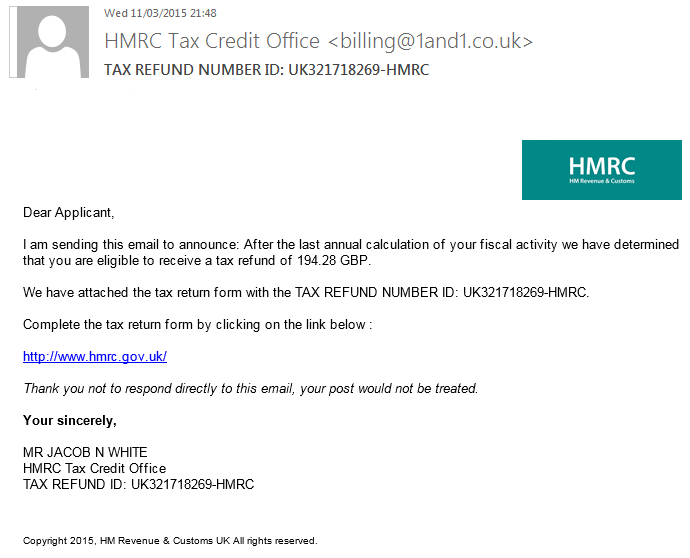 I am sending this email to announce: After the last annual calculation of your fiscal activity we have determined that you are eligible to receive a tax refund of 194.28 GBP. We have attached the tax return form with the TAX REFUND NUMBER ID: UK321718269-HMRC. Copyright 2015, HM Revenue & Customs UK All rights reserved. 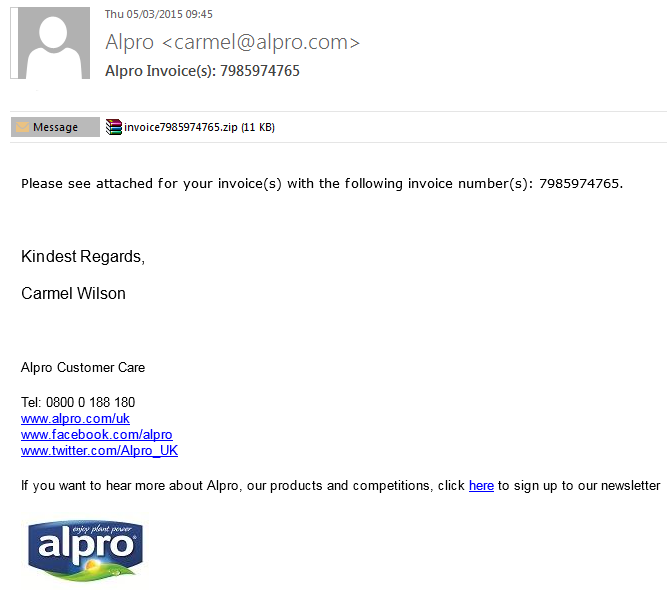 Please see attached for your invoice(s) with the following invoice number(s): 7985974765. To view the attached document, you will need the Microsoft Word installed on your system. Please find another board order attached for delivery as soon as possible. There is quite a lot of wastage on these ones in particular. How would we get charged? ½ boards or full? 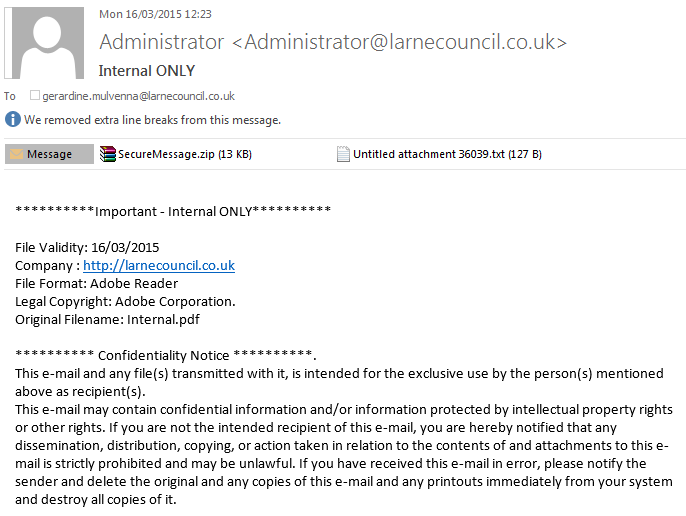 This email is confidential, may be legally privileged, and is for the intended recipient only. Access, disclosure, copying, distribution, or reliance on any of it by anyone else is prohibited and may be a criminal offence. 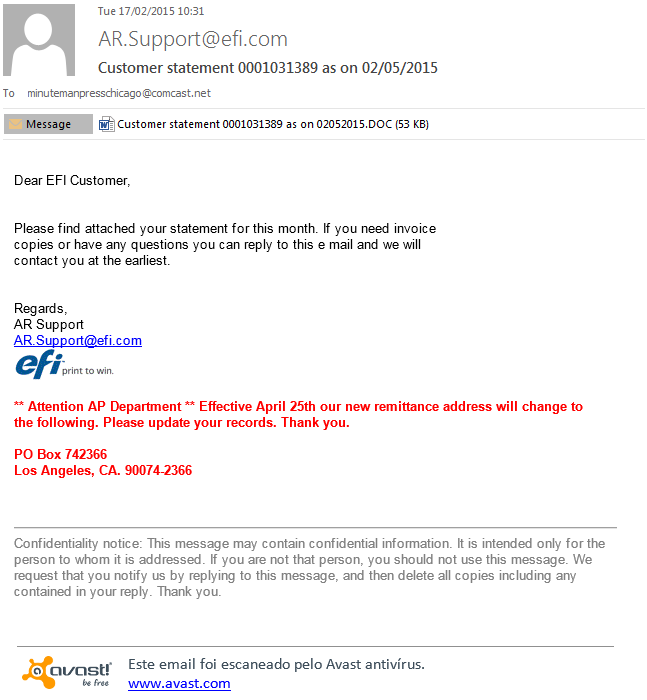 Please delete if obtained in error and email confirmation to the sender. Internet communications are not secure and therefore the sender does not accept legal responsibility for the contents of this message. The information transmitted is intended only for the person or entity to which it is addressed and may contain confidential and/or privileged material. Any review, retransmission, dissemination or other use of, or taking of any action in reliance upon, this information by persons or entities. To proceed to confirm your account information please click here and follow the instructions that will be required. ⓒ 2015 Apple.com All rights reserved. 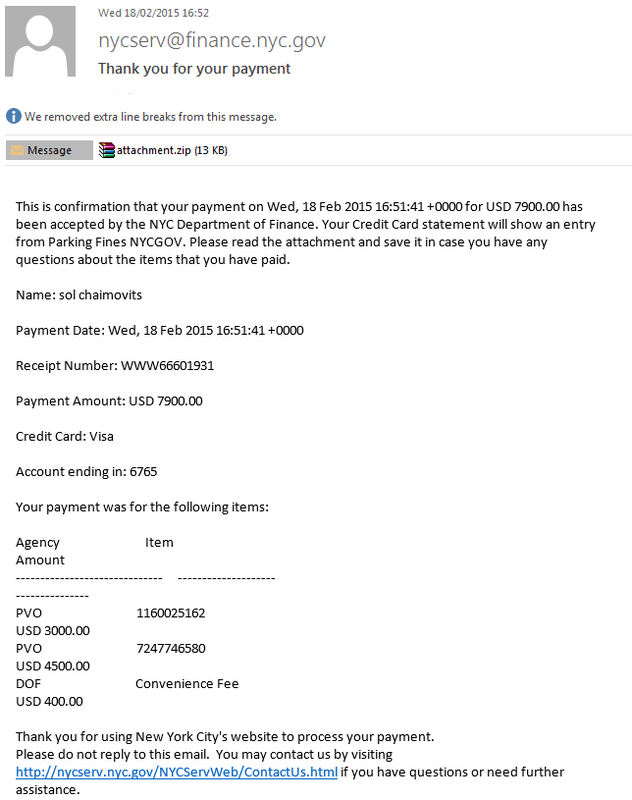 This is confirmation that your payment on Wed, 18 Feb 2015 16:51:41 +0000 for USD 7900.00 has been accepted by the NYC Department of Finance. Your Credit Card statement will show an entry from Parking Fines NYCGOV. Please read the attachment and save it in case you have any questions about the items that you have paid. Please do not reply to this email. You may contact us by visiting http://nycserv.nyc.gov/NYCServWeb/ContactUs.html if you have questions or need further assistance. Hope you are OK. I am writing you to let you know that whole amount specified in the contract has been paid into your bank account on the 12th of February at 16:25 via BACS payment system and should reach the destination (beneficiary's) account within 3 working days.